I’ve just had the pleasure of being inspired by Keryn Davis at Core Education, New Zealand. Keryn was speaking to a selected group of talented NZ teachers and the not quiet as talented me, who are all carrying out research projects on teaching and learning in 2015. Keryn spoke to us about the power of play in schools and used research and her own data to convince all of us that this was a significant issue for educators to explore. 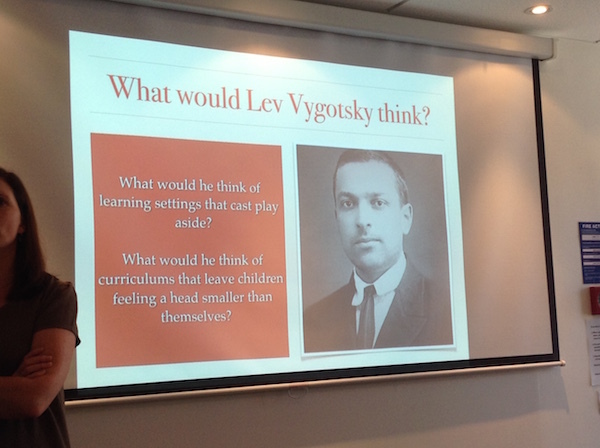 Starting with the work of Lev Vygotsky, Keryn highlighted that people naturally stretch themselves during play. Vygotsky said: “In play, a child always behaves beyond his average age, above his daily behaviour; in play it is as though he were a head taller than himself.” This idea struck me as quite profound and had me hooked the rest of the way. Next we were taken through some inspiring examples from her own research where play had been first introduced as a special hour at the beginning of the day, for “proper” school to commence afterwards. She explained how the positive results from this specially timetabled hour of play had led the schools to extend it and use elements of play throughout the day, making the most of opportunities that arose. Learners naturally started to organise, lead others and collaborate. I highly recommend you read more about her work here. What I liked most was how she linked play to considering the level of true involvement a child displays in any school activity and finally onto the idea of flow, being a state of intense concentration on the present moment. As a tool for measuring activity and flow, we were introduced to the Leuven Scale for Involvement. Originally designed by Ferre Laevers. This is used by elementary school educators to grade students during observations regarding how involved they are in various activities during the school day. Normally data is gathered by recording the observed involvement in activities of one child at a time as they carry out the different types of tasks in one day. I can’t see why these wouldn’t apply in principal to a learner of any age. Nakamura and Csikszentmihályi identify the following six factors as encompassing the experience of flow. 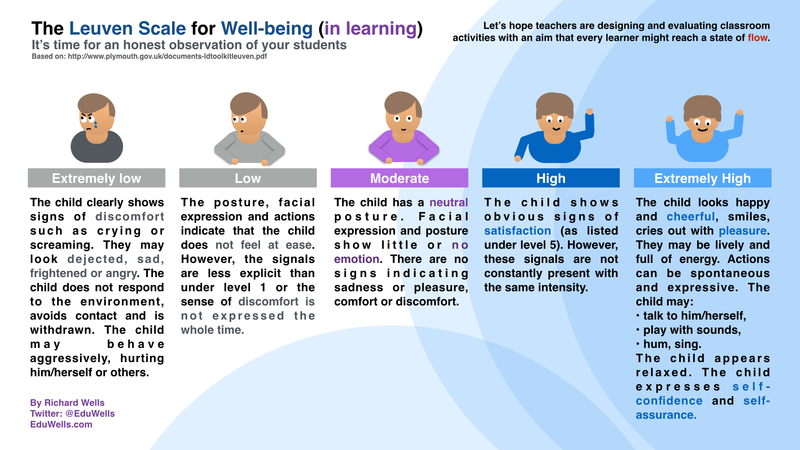 All teachers have the opportunity to design school structures and activities with an aim that children will experience states of flow during their day. These two scales are also useful for a teacher to use in judging their own activity design and classroom structures. What does this mean for iPads? 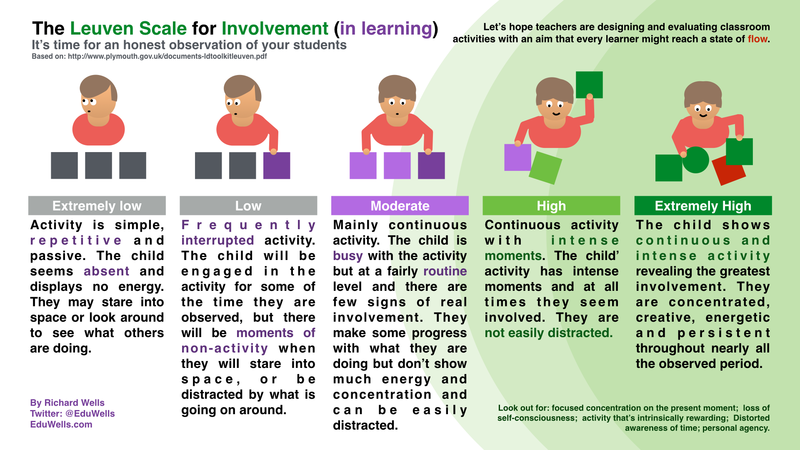 Combining the ideas behind play, involvement and flow, I believe teachers need to be open-minded when deciding how and/or when iPads will be used by learners. Allow learners to play and express themselves. Let them build their own learning experience and in doing so become more focused and absorbed in the moment. 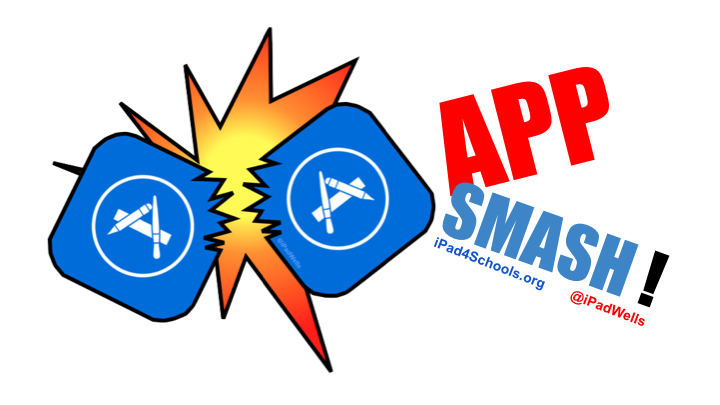 App Smashing is a great example of this, as long as it’s not the teacher prescribing the exact apps to be smashed. Learners should develop their own workflows and styles of output. Having to conform to any generic structure for learning is always going to lessen the chance that moments of true flow might develop. The flexibility and massive possibilities for expressing, creating and publishing from iPads means they can enable a learning environment that caters for every individual. Personal agency can lower self-consciousness and this might in-turn lead to deeper learning and students lost in moments of their own creation. Previous What will be the most significant classroom innovation in the next 10 years?